Creeks of the Upper South. Amy Wright & William Wright. Jacar Press & Unicorn Press. Durham, North Carolina. 2016. Collaborations in poetry can be damned hard work. 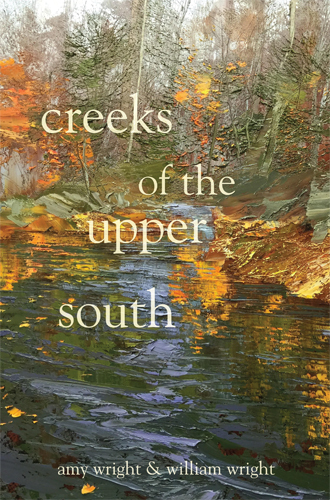 Creeks of the Upper South is a call and response collaborative book of poems from Amy Wright and William Wright and it is seamless. Today's book of poetry has attempted different types of collaborative poetry with mixed results. It's hard enough to find someone you agree with on anything let alone finding someone to share a page with. It is deep, murky water and there are dangers everywhere. All of that to say that Today's book of poetry marveled at the synchronicity in every danced step between Wright and Wright. houses that did not kneel and drift away moldered. They moved the whole town eight miles north. as the soles of her feet and silty hands. joy at the sheer oddness of how the Earth had reined it. slew the boy she kissed and dragged his kin down into the gorge. now in the earth proper, slack and laggard slow. Now if that isn't gothic/romantic enough for you I'll eat my shorts. Wright/Wright take you down to the water to see if you'll float. They make you walk barefoot .through the millennial ooze, the silt of their ancestors. This is captivating stuff, you open the cover to this little gem and you are instantly under the spell cast by Wright/Wright. Wright x2 have a biologist, historian, anthropologist, geologist and a bevy of scientists on their research team and along with their own gothic charm it makes for a riveting crossing of all this stormy water, the Wrights have roiled up the water and we are in for an emotional voyage. Their rich lingo sings of a particular notion of the South, I can see Carson McCullers and William Faulkner at the edge of one of these coulees, Flannery O'Conner is probably somewhere nearby. with such reckless fear that she took a spade to its skull. wolf spider, the bubbling muck of toads. pierced the thicket and drowned our scalps. There is no such thing as empathy. of us, a great spectral womb broken, ripped. its washed-out susurrus, its sealed mouth. where heaped stones were draped with lichen. and grind of crickets in the core of a summer long dead? to the backdoor, the red light that framed it. leaf that withered, that would not release. These poems have a cumulative effect on the sodden reader. Wright & Wright know their business and their business is to write emotionally haunting and visually stunning poems that get under your skin like a poetry tick. Today's book of poetry has long admired the voice of Shelby Foote. Foote was a historian and novelist and he had a voice of such gravitas and humour, warmth and wit, that I could happily of sat and listened to him read a phone book. Shelby Foote reading Creeks of the Upper South is an entertainment I would pay almost anything for. He'd ride over these poems with the perfect verbal caress. These are poems that should be read aloud. wild decay (never gothic) and wildest revival (never lofty). Amy Wright and William Wright have done something remarkable. It is not just that they have become one voice for the purposes of Creeks of the Upper South, but that they have become a choir, in unison, with resolve. Amy Wright has authored two poetry collections and five chapbooks. The Nonfiction Editor of Zone 3 Press, Coordinator of Creative Writing and Associate Professor at Austin Peay State University, she has been awarded a Peter Taylor Fellowship for the Kenyon Review Writers’ Workshop, an Individual Artist’s Fellowship from the Tennessee Arts Commission, and a fellowship to the Virginia Center for the Creative Arts. You may find some of her work online at: awrightawright.com. William Wright is author of four books of poetry, most recently Tree Heresies and Night Field Anecdote, as well as four chapbooks. He is editor of eleven editions, including all volumes ofThe Southern Poetry Anthology series (Texas Review Press), two texts centered on Gerard Manley Hopkins (Clemson University Press, forthcoming, 2016), and Hard Lines: Rough South Poetry (USC Press, forthcoming, 2016). He is assistant editor of Shenandoah.